Popartist Andy Warhol (1928 – 1987) has two new exhibits that just opened in two of the Smithsonian Institution’s 19 museums – the world’s largest and most prestigious collection of museums – all with free admission – on The Mall in Washington, DC. The exhibits are called “Warhol: Headlines” at the National Gallery and “Andy Warhol: Shadows” at the Hirshhorn Museum. “Shadows” is the most interesting of the two exhibits, a collection of 102 silk screens and hand-painted pictures, all in different colors on the same theme, exhibited together for the first time. Warhol made “Shadows” 1978-79, when he was 50 years old. 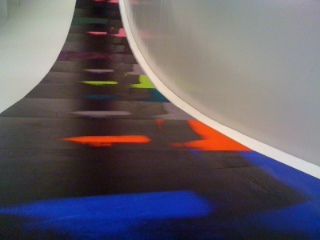 They hang close together, in a long, long line, on the Hirshhorn’s circular showroom wall. It’s perfect. Take a look! This entry was posted in Cities, Culture, Media, WashingtonDC and tagged Andy Warhol, Popart, Smithsonian, USA, Washington. Bookmark the permalink.